Elegant, atmospheric, delicate, spine-chilling: if you’re not yet reading Emma Carroll, you’re missing a trick. Her wondrous books tick so many boxes we hardly even know where to start. Perfect nostalgia reads. Haunting spine-chillers. Grand adventures in the Blyton tradition. Doorways into a long-long past. 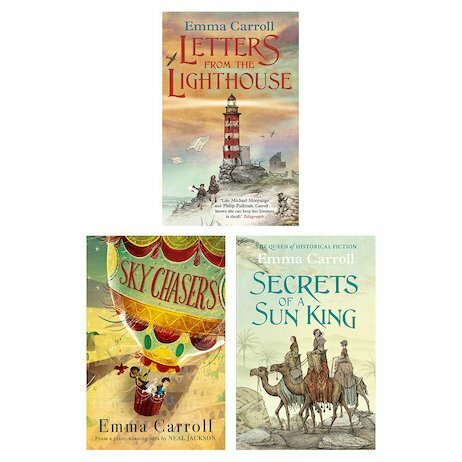 There’s a wartime mystery involving hidden codes and kids who live in a lighthouse. There’s the spooky tale of a cursed mission to Egypt in search of a lost pharaoh’s tomb. Or how about flying high above Paris on the world’s first hot air balloon ride? Instantly classic fiction. Prepare to fall in love with it.